Unravelling 1987: All hail the reprint of Battle for Merger? When the Battle for Merger was relaunched, I was looking forward to a battle for ideas and interpretations between old thoughts and new revisions. So maybe I was a little disappointed when the new wave of revisionists treated the reprint with almost equal delight. From their previous arguments that there was no communist conspiracy and no red star over leftist politics in Singapore, and that LKY/PAP essentially jailed the political opposition, I was quite surprised that they did not urge caution over One Lee's view of things. Side note: BfM is a primary source because LKY was an actor. I am not sure if you would call the works of Tim Harper, Hong Lysa and Geoff Wade primary sources. Previously, I had written about the special acquaintance between communist boss Fong Chong Pik (or Fang Chung Pi) and Lim Chin Siong, and the Battle for Merger presents more details of Fang as the hand that rocks the cradle. 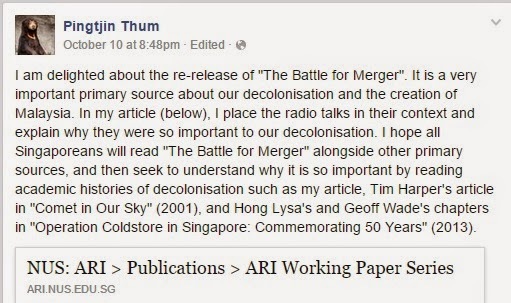 According to BfM (read Albert Lau article appended below), Fang was the one who instructed Lim to thwart the plans of Merger after Tunku Abdul Rahman announced that it was possible that Singapore and the Borneo territories gained independence thru Merger. Next, Fang met Lim after the Anson by-election and immediately before the Eden Hall Tea Party, the exact details were unknown. Again, according to BfM, it was a British ploy (during Eden Hall) to trick Lim into believing that they would have an equal chance to form the government if they guaranteed British military bases. After which, Lim had the confidence to began his open warfare with LKY, resulting in an open split of the PAP and the forming of Barisan Sosialis. LKY later pressed that it was Fang that gave the instruction for all communists to leave PAP and join BS. The resulting exodus was 19 of the 23 PAP organising secretaries and 60-70% of the PAP membership leaving to join BS. Now it was interesting to read that LKY could say this of Fang and Lim with such accuracy and details (and not encounter strong resistance). Did he have access to the files of Special Branch who were definitely conducting surveillance on communist operatives in Singapore. Or access to other foreign intelligence services such as the Brits and Yankees who were informing him of the communist underground? The year was 1961. One Wednesday evening in September, then Prime Minister Lee Kuan Yew took to the airwaves to begin the first of his "fireside" chats to the people. There was as yet no television, which was still 17 months away from putting out its pilot broadcast. At first glance, there seemed nothing unusual about the Prime Minister making a radio broadcast. Except that in the space of less than a month, Mr Lee would make an unprecedented 11 more broadcasts in a row over Radio Singapore, each within days of the other, on Mondays, Wednesdays and Fridays. Even more remarkable, the Prime Minister would relay each broadcast in three languages - English, Malay and Mandarin - to reach the widest audience. These 12 talks were no ordinary radio broadcasts. Aired between Sept 13 and Oct 9, they were in fact the opening shots in what would soon become a keenly fought battle for the hearts and minds of the people of Singapore. The immediate context was a referendum that Mr Lee's People's Action Party (PAP) Government intended to hold in a year's time to decide on a matter that would vitally affect the lives of the people on the island: merger with Malaya. RIGHT from the start, the PAP had communist and pro-communist elements within the party. In their desire to form a mass-based anti-colonial political party in 1954, the English-educated non-communist founders of the PAP solicited the help of Chinese-educated communist and pro-communist activists, like trade union leaders Lim Chin Siong and Fong Swee Suan, to bridge the gap to the majority Chinese-educated world. By then, the outlawed Malayan Communist Party (MCP) had all but lost the jungle war; a disappointing setback that prompted its secretary-general, Chin Peng, to leave his jungle hideout and meet Tunku Abdul Rahman to discuss the latter's amnesty terms at the historic Baling talks in December 1955. Though agreement was not reached at Baling, the failure of its guerilla campaign in the Federation (of Malaya) had left the MCP with no practical option but to defer its goal of a united communist Malaya for an indefinite period and settle on achieving socialism in a smaller place - Singapore. To pursue its anti-colonial activism in this new urban setting, the MCP needed a legitimate left-wing political party to provide cover for its subversive activities and it found willing collaborators in the PAP's English-educated leaders. Thus, for reasons of mutual political expediency, the two groups were able to forge a united front. Collaboration, however, had its hazards, for the communists and pro-communists the PAP attracted soon endeavoured on numerous occasions - famously in May-June 1955 and October 1956 - to enmesh the party in supporting or condoning their advocacy of forceful mass agitation, using the Chinese-educated middle school students as their shock troops and their control of strategic trade unions to precipitate widespread industrial action accompanied by debilitating riots. The more critical dilemma facing the united front, however, lay in the two groups' conflicting attitudes towards merger. From its founding, the PAP's objective had always been to take Singapore into Malaya. When the PAP formed the government in 1959, the goal of "independence through merger" was pursued unwaveringly as the next logical constitutional step for Singapore. This, however, was not in the interests of the communists. After Malaya was granted independence in 1957, the MCP had lost its raison d'etre as far as anti-colonial agitation in the Federation was concerned. Only Singapore, which was still in a semi-colonial state, offered the communists scope for continuing their anti-imperialist struggle. For this reason they opposed the PAP's strategy of "independence through merger". A Singapore independent together with the rest of Malaya would make it more difficult for the communists to camouflage their battle on behalf of communism as an anti-colonial struggle. Moreover, merger would also mean placing internal security in the hands of a rabidly anti-communist Kuala Lumpur government, which had since 1959 shared joint custody over Singapore's internal security through its participation in the Internal Security Council (ISC) with Britain and Singapore. The Federation government would certainly spare no effort to put down the communists on the island. But even though the extreme left-wing in the PAP fundamentally opposed merger, they were willing, for the sake of the united front, to pay lip service to it - at least so long as the possibility of fusion remained remote. This state of uneasy tension remained until May 1961. The Tunku's Malaysia announcement, however, fundamentally changed all that. Once merger became a genuine prospect, the communists took alarm. Within days of the Malayan leader's speech, Lim Chin Siong conferred with Fang Chuang Pi, one of the communists' top three leaders overseeing Singapore and known to Mr Lee, who met him furtively on several occasions, as "the Plen" (for plenipotentiary). Beginning in June, the extreme left came out openly to oppose merger. Through six leading trade unionists led by Lim, and backed by some 42 unions in a show of force, the pro-communists obliquely threatened to withhold support for the PAP candidate in the July 15 Anson by-election (occasioned by the death of a PAP assemblyman) unless the CEC substituted its "independence through merger" line for the communists' agenda of "complete internal self-government", that is, without the ISC. When the PAP leaders refused and proclaimed unequivocally their commitment to achieve "independence through merger" by 1963, a war of words ensued, with escalating intensity as both sides exchanged blow for blow, knowing full well that it would lead either to one side or the other giving in, or to a complete break. Meanwhile, Lim had been luring disaffected assemblymen to his side for the purpose of assembling a shadow team ready to capture the PAP and take office. Two days before polling day, eight dissenting PAP assemblymen, led by Dr Lee Siew Choh, came out openly to denounce the party leadership and throw their support behind the trade unionists. Lim also threw his weight behind the Workers' Party candidate, David Marshall, who went on to win Anson by a narrow margin. On July 16, a day after the PAP lost Anson, Fang Chuang Pi again conferred secretly with Lim Chin Siong. Two days later, an urgent approach was made to see Lord Selkirk, the UK Commissioner, who invited a pro-communist group, which included Lim and three others, for tea the same day. In his radio talks, Mr Lee subsequently charged that the British, with consummate skill, had deliberately tricked Lim and his radical group into open conflict with the PAP moderates by giving them the impression during their meeting at the UK Commissioner's residence on July 18 that if they left the British bases alone, they could form the government, provided they acquired power constitutionally. Confronted by such treachery, Mr Lee called for a vote of confidence in the Legislative Assembly on July 20, five days after the polls, before Lim could win over more assemblymen. The debate lasted until the pre-dawn hours of July 21. When the vote was taken, 26 PAP assemblymen and one independent supported the Government against eight who opposed the motion. There were 16 abstentions, 13 of which were by PAP assemblymen. The delaying tactics of the pro-communists to gain time for more defections failed. After the meeting, Mr Lee proceeded to break up the united front and expelled the 13 PAP assemblymen who abstained. Fang Chuang Pi then instructed all communist members to leave the PAP and form a new proxy political party. Six days later, they launched the Barisan Sosialis, which was officially registered on Aug 13, with Dr Lee Siew Choh as chairman and Lim Chin Siong as secretary- general. Some 19 of the 23 organising secretaries in the various PAP branches and possibly 60 to 70 per cent of the PAP membership crossed over to the new party. Not all who defected were communists or pro-communists. Some thought the days of the PAP were numbered and wanted to join the winning side. At this stage, the PAP was in the doldrums. It had lost two by-elections in succession. Its organisation was shattered. And, in the Assembly, its position had become precarious in the extreme, clinging on to power by a majority of one. Nevertheless, the abrupt ending of its united front with the communists gave the PAP the clean slate it needed to rebuild the party from scratch, this time without communist influence.